I can’t believe the difference between halogens and LEDs. On low beam the LEDs seem brighter than my old systems on bright. My old systems on low beam is about equal to driving with the new systems and wearing sunglasses. I’ve had them 3 months and I haven’t had one on-coming car flash their brights at me. Night time driving is now a whole new world to enjoy those few hours I have time to take the car out. It’s funny: As I pass road side signs, they reflect back so clearly I almost need to wear sunglasses. So my experience says if you have an older car and interested in seeing MUCH better at night, these lights are the solution. Maybe 5 min installation. They are slightly heavier but only maybe a couple of pounds. And “it is not a race car” anyway. They were an investment…with big payoffs. I recently built a set of LED headlights (along with LED turn signals) for a friend who lives in Alaska – where it’s dark dark and there are lots of critters – and it worked out well. 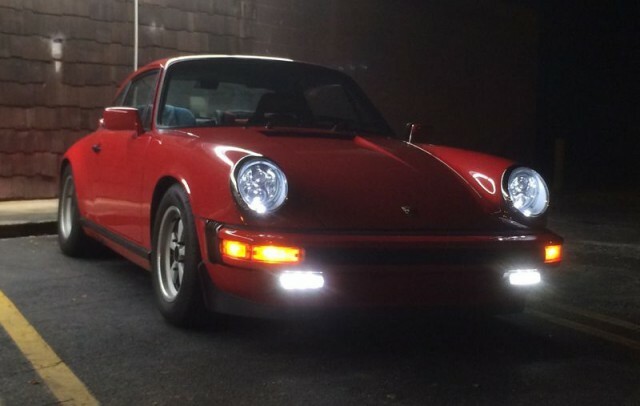 That motivated me to research the various options available for LED lighting in Porsches. I ended up testing three brands: TruckLite 27270C; JW Speaker 8700 Evolution 2; and Nolden Pilot VP-3106B. 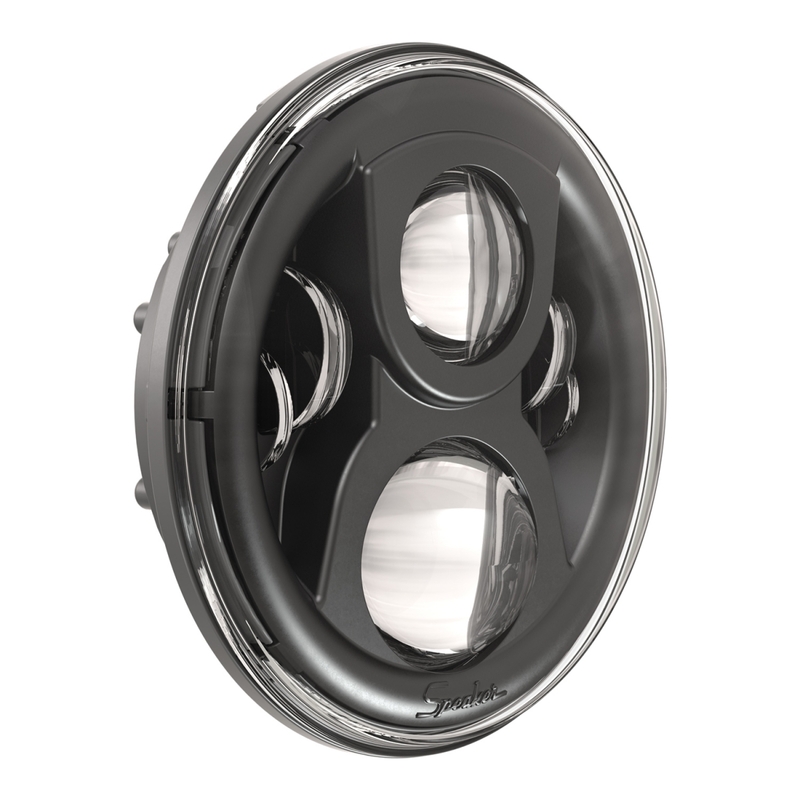 They all reviewed and tested well and I settled on offering the JW Speaker 8700 Evolution 2 LEDs, a perfect match in performance and quality for our Porsches..
JW Speakers outshone the Truck-lite and pretty much all of the competitors. Better output and better clarity but you get a smack in the face of price that makes people pause. The price to me is not the issue, you see a LED is going to last as long as 50+ Halogen bulbs. So even if you are spending $20 a light for replacement bulbs you are still above the price of an LED headlight. So this is one of those buy and forget about it purchases. Don’t get me wrong, the Truck-lite did very good and would be a nice entry into the LED market. The difference between the two is what you can achieve with solid optics vs. reflector design with a LED. The light from the J.W. Speaker just left it and everything else in in the dust. The J.W. 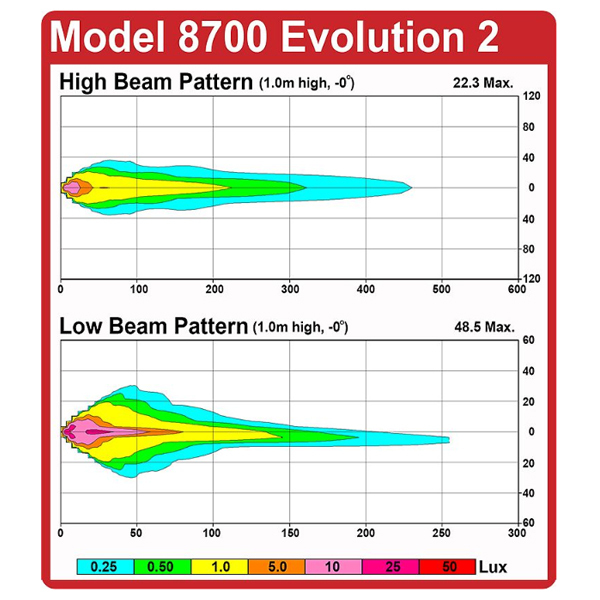 8700 Evolutions put out more light at distance and much, much more evenly. JW Speakers are by far the best headlight I have ever seen. They are ridiculously well made and designed and are worth that kind of money. I understand the value over time of owning them, they last as long as 50+ halogen bulbs or 20 something HID’s, that is a LONG time. No moving parts or bulb to break and a very low amp draw are even more selling points. I learned a while ago that rarely sometimes you do get what you pay for. I was seriously skeptical of the value of these lights and I am glad I was proven wrong. The low beam illuminates the road ahead – and the shoulders – to a width of 30 meters, almost 100 feet. Nice in areas where there are animals to watch out for out night. And the high beams project out 450 meters – that equals 1,476 feet or 492 yards. That’s well over a 1/4 mile, almost 5 football fields! 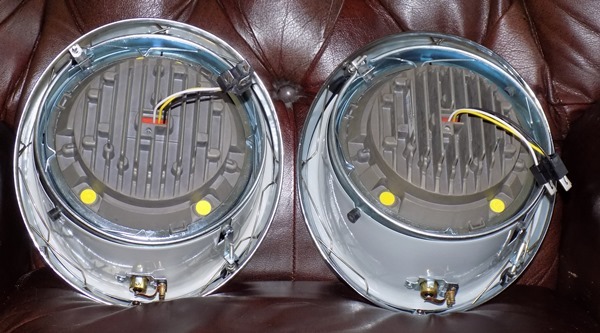 Here are some pictures comparing JW Speaker first generation LEDs with the current generation. I think they’re a generation ahead of most LEDs. First generation low beam vs. current generation low beam. Note how the light starts almost immediately in front of the car and fans both ways quickly. 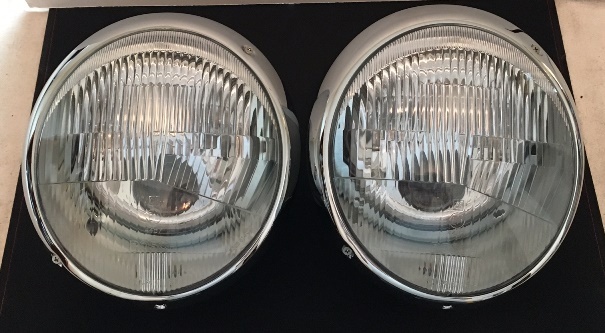 First generation high beam vs. current generation high beam. Current generation is wider and brighter. Assemblies are built to order. 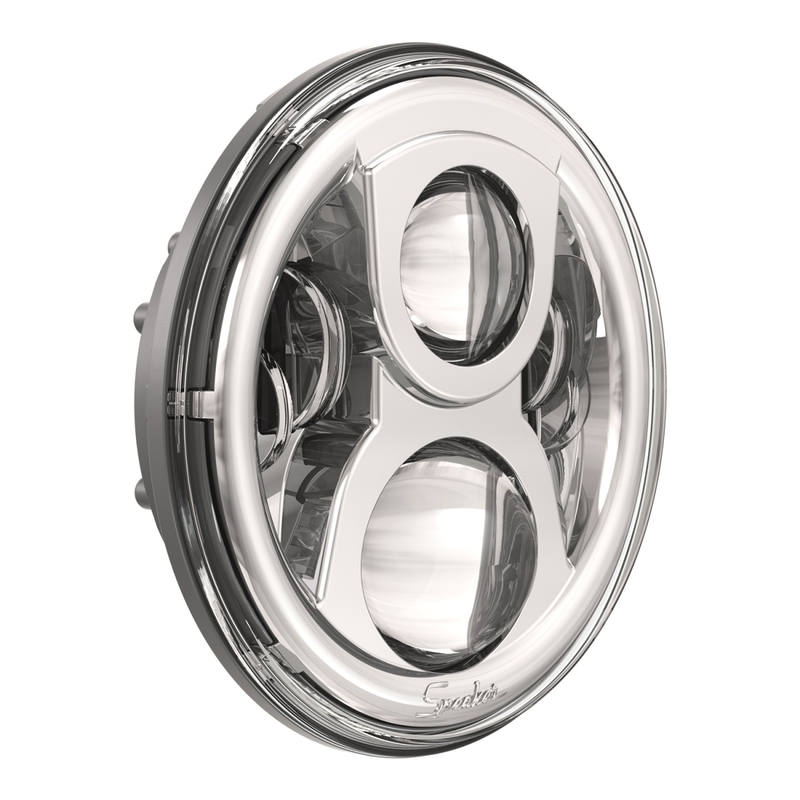 They are available for North America in chrome (PN 0549711) or black (PN0549701) bezels and chrome trim rings are standard. You can also order them with black or primered trim rings. 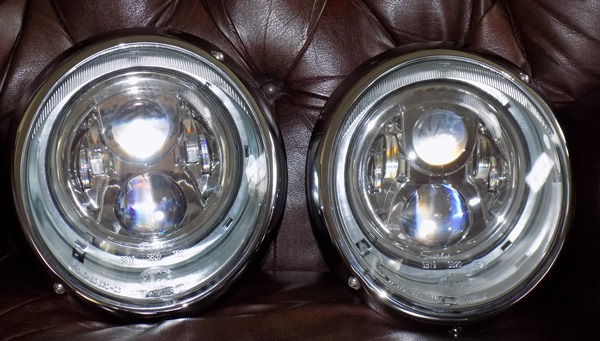 If you have H5 headlights you will need an H5/H4 adapter, available for $27.00. Otherwise installation is plug & play. Delivery is 8-10 days.